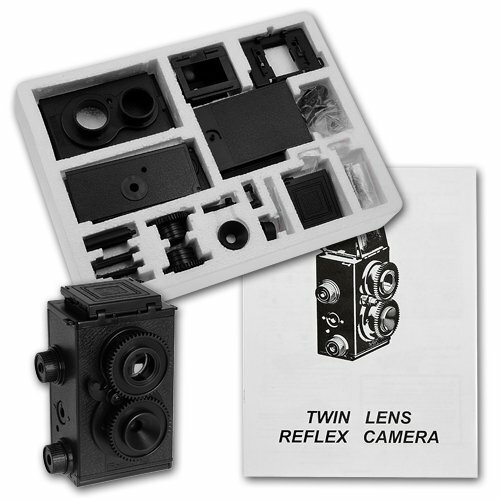 Some of you might be know about this 35mm TLR Kit. Well for that price I had to give it try. Inside the box you find pieces that took me back to the days of building model cars, and knew I had a decent amount of work ahead of me. The Lego-esq directions were pretty clear, and everything was going well until I got to the part of building the shutter assembly. There was a little, quite strong spring that needed to afixed to the shutter mechanism. This didn't seem too bad until, *PEW* I launched it across my room to be lost forever! After searching for a couple minutes, I knew it would never be found, and defeated, shelved the project. A while later I was telling my sob story to a friend and she mentioned she had the same kit, untouched, and offered it to me to replace the spring. Yes! A second chance. This time I wasn't going to let that spring get away from me. So I prepped the workspace to try and catch any fly aways and tried my darndest to get that lil guy in its place. *PEW* it flew away again, this time I was able to find it again. Alright one more try. *PEW* G(&*#(*&@#$ IT! The second time I actually found it in a spider web behind my computer. At this rate I felt doomed to lose the spring again and have one tiny piece missing from two kits. So I decided to cut my loses and take a different route. What kind of camera doesn't need some fancy "spring powered" shutter? That's right, a pinhole! High tech tape shutter here I come. 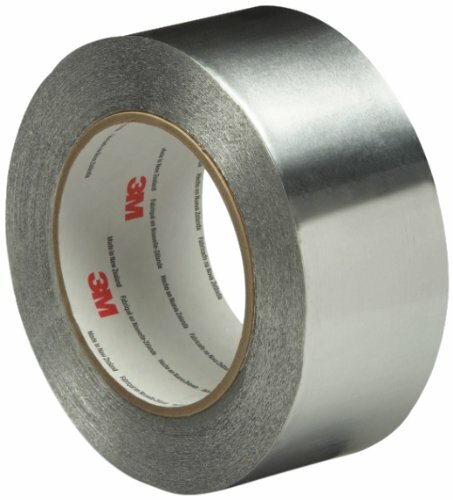 I used some of foil tape, like this(very useful to have around for photography as it's pretty guaranteed to be light tight), and made myself a hole with a pin. With some debate I concluded to still use the front element of lens and place the pinhole right behind it(I should probably do some testing to see if this is really the best way to go). I had an old expired roll of Agfa APX 25 that I'd never found a good reason to use, so I figured it'd make a nice test roll for this contraption. The camera has a tripod mount so I used that to attach it to a clamp and gave it a go. Here are the results. I did some shots of my room and then took it into the office, I was really looking to capture some stationary objects and also some motion. Using a pinhole inside, in dimly lit places with expired 25 iso film, I pretty much just clamped the camera places and left it for a couple hours. I know, I should have taken notes on what my exposures were, but I'll do that next time ;). 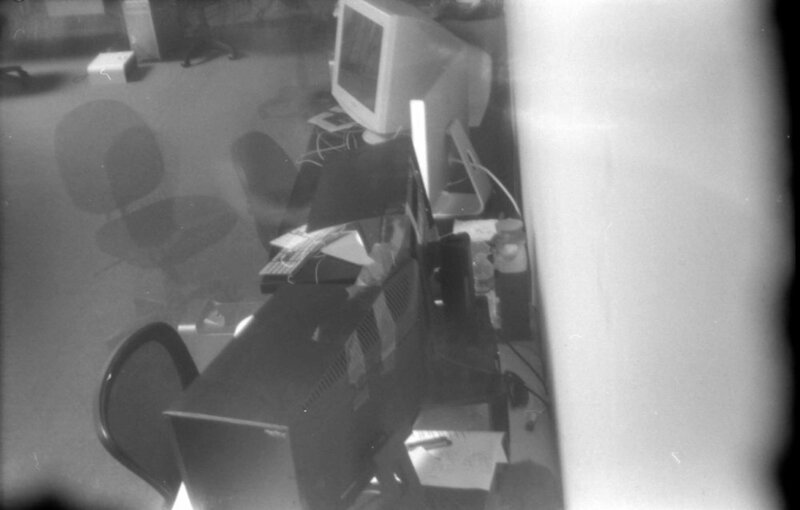 Something I realized when looking back at the images was that some of the spots I'd set the camera up on where at a weird high angle(there's a lot of exposed pipes in the office) and they reminded me of security cameras, a weird long exposure securty camera. I'd like to expand on this idea as I had a short lived project about watching unlocked security cameras I found on the internet. (@portalwatching) I just need to pick up so super low ISO before that isn't a thing anymore.